At the age of nineteen, Lara Prior-Palmer discovered a website devoted to "the world's longest, toughest horse race"--an annual competition of endurance and skill that involves dozens of riders racing a series of twenty-five wild ponies across 1,000 kilometers of Mongolian grassland. On a whim, she decided to enter the race. As she boarded a plane to East Asia, she was utterly unprepared for what awaited her. Riders often spend years preparing to compete in the Mongol Derby, a course that re-creates the horse messenger system developed by Genghis Khan, and many fail to finish. Prior-Palmer had no formal training. She was driven by her own restlessness, stubbornness, and a lifelong love of horses. She raced for ten days through extreme heat and terrifying storms, catching a few hours of sleep where she could at the homes of nomadic families. Battling bouts of illness and dehydration, exhaustion and bruising falls, she decided she had nothing to lose. Each dawn she rode out again on a fresh horse, scrambling up mountains, swimming through rivers, crossing woodlands and wetlands, arid dunes and open steppe, as American television crews chased her in their jeeps. 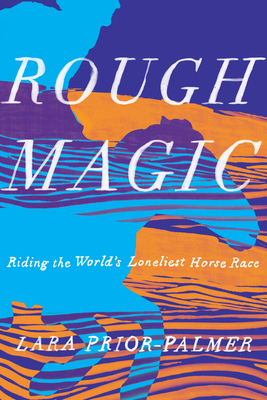 Told with terrific suspense and style, in a voice full of poetry and soul, Rough Magic captures the extraordinary story of one young woman who forged ahead, against all odds, to become the first female winner of this breathtaking race. LARA PRIOR-PALMER was born in London in 1994. She studied conceptual history and Persian at Stanford University. In 2013, she competed in the 1,000-kilometer Mongol Derby in Mongolia, sometimes described as the world's toughest and longest horse race, and became the first woman to win the race, and the youngest person ever to finish. Rough Magic is her first book.